At some point, you’ll probably run into a problem that doesn’t seem to have an easy solution: one of your default User folders in Windows 7 (My Documents, My Pictures, My Music, My Videos, Downloads, and Desktop) will suddenly disappear. 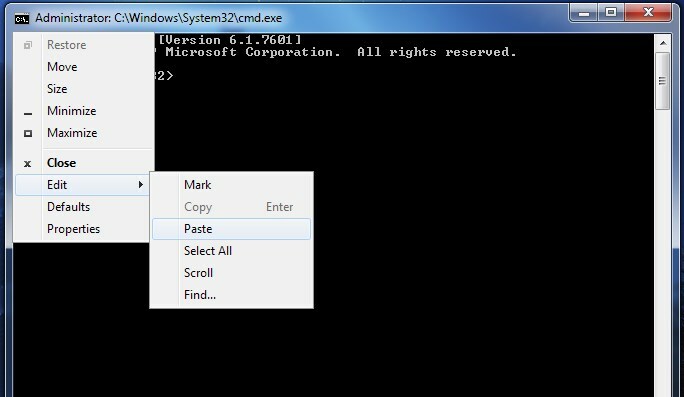 There is a lot of info out there on how to fix these built-in Windows 7 folders, but it’s all rather complicated. So, here’s the boiled-down, anybody-can-do-it version on how to restore your missing User folders – or so I hope! These are the actual names of the folders as stored on your hard drive, but since we’re talking about special User folders, they are magically turned into “My ___” folders with the special icon. Don’t worry, it’s all very simple! Here, you’re going to need to decide which folder(s) are screwed up. For example, if you see “My Documents” and it’s a magic icon, you do not need to do anything. If you see a normal yellow folder called “Documents”, do nothing. If there is no “My Documents” or “Documents”, then create a new folder C:\Users\USERNAME\Documents. Maybe only your Downloads folder is screwed up, and all the other folders are okay (Desktop, My Documents, My Music, My Pictures, My Videos). In that case, make sure there is a folder “Downloads”. If there is, go to the next step. If there isn’t, create it first. This part might seem scary, but it’s really easy. 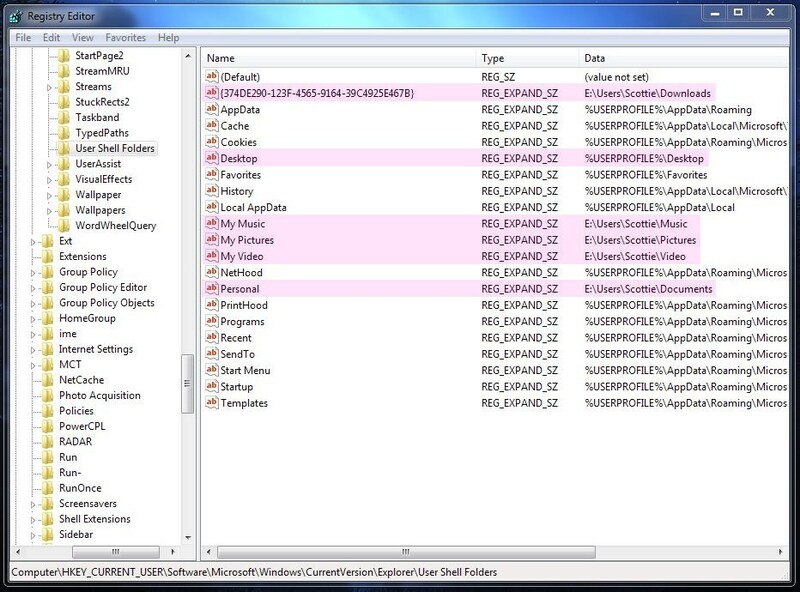 Now, in Windows 7, the path C:\Users\USERNAME\ is often written as %USERPROFILE% internally in Windows. This is just a variable that points to your Users directory. Simple, yes? It’s also quite handy. Don’t ask me why the Name for Downloads is that wonky string, or why the Name for Documents is “Personal”… It’s Microsoft. 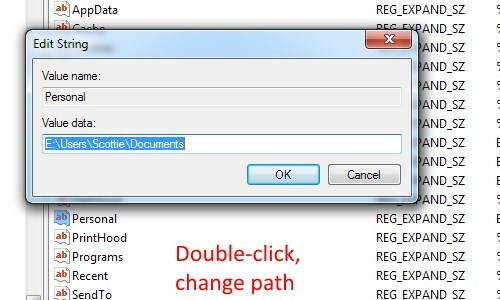 In my example, I don’t want My Documents pointing to E:\Users\Scottie\Documents, because I don’t have E: any more! Oops. First, I made C:\Users\Scottie\Documents in the steps above. 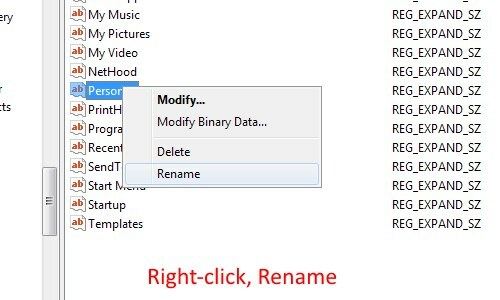 Do the same for any other User folders you need to fix. When you’re done editing, just close the Registry Editor (it saves automatically). That’s it. 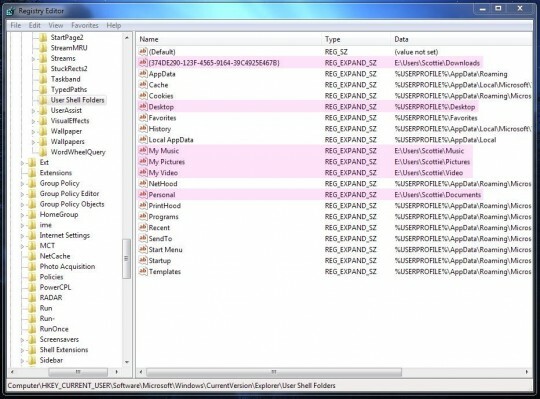 You’ve made sure your missing folder(s) exist, you’ve done some Registry hacking to reset the Magic Folders, and you’ve set the proper attributes on your new folders. All that’s left is to reboot! When you log back in, you should see your User folders restored to mint, magical condition. Hopefully, this has been fairly easy to follow. For other User folders (Contacts) or for Windows 8, check out Seven Forums tutorial on this very topic. I found their explanation rather difficult to follow, but it does have more information – and even some .REG files you can download and run to avoid doing any registry editing yourself. Check it out!